Bobble Hat is in stock. We will print it as soon as you order it. 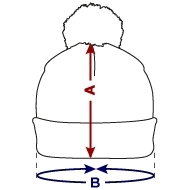 Call it bobble cap or bobble hat – our headgear will keep the cold at bay and the ears warm, just what you need when it gets cold out there. Fresh colour combinations turn this hat into an instant classic for winter and anyone looking for a stylish accessory to complete their look.